Given the importance of the "heiress-queen", it may be presumed that it is an heiress queen shown standing next to Menkaure in the statue. The woman is commonly identified as Khamerernebty II. But, was Khamerernebty II Menkaure's "heiress-queen"? In order to answer this question it is necessary to reconstruct, as much as it is possible, the female line of descent through the 4th Dynasty. For the most part, I have followed the family relationships laid out by George Reisner (1931) [see BIBLIOGRAPHY], William Stevenson Smith (1955) [see BIBLIOGRAPHY], and Ahmed Fakhry (1959) [see BIBLIOGRAPHY], but have interpreted perceived relationships from a matrilineal perspective. It's a rather complicated history and the following section is dense with names and relationships; you can skip to the end for my conclusion if your not interested in this sort of thing. First, a few words about the chronology and dating of the Dynasty IV. The order of succession of pharaohs in the Old Kingdom has been more or less established using "king lists", compiled mostly in the period of the New Kingdom, of which one of the most important was written on papyrus during the reign of Ramesses II (c. 1301-1234 BCE) and is now in the Turin Museum. The Turin Papyrus provides not only the order of succession but the length of reign, though the latter especially often seems fantastical. While a workable relative chronology can be established, an absolute chronology, the actual dates of a pharaoh's reign, remains imprecise. The problem of dating has been exacerbated by the tendency among Egyptologists over the past twenty or thirty years to down-date earlier chronologies, which effectively lowered the founding of pharaonic Egypt, and the beginning of Dynasty I, to around 2955 or 2920 BCE, with Dynasty IV beginning around 2600 BCE. Since the late 1980s, however, following the analysis of eighty new carbon samples collected from the pyramids, it is now necessary to shift the entire chronology up by approximately 300 years or so. Dynasty I now begins around 3400 BCE (as it had done earlier before the down-dating trend), and Dynasty IV around 2900 BCE. According to the Turin Papyrus, Sneferu [Snofru], the first pharaoh of Dynasty IV and the builder of the pyramids at Dahshur, reigned for 24 years. His successor, Khufu (Cheops), who is believed to have built the first of the great pyramids at Giza around 2570 BCE (now revised to c. 2870 BCE), reigned for 23 years, Khafre (Chephren), the builder of the second pyramid around 2530 BCE (now c. 2830 BCE), reigned for 25 years, and Menkaure, who built the third pyramid around 2500 BCE (now c. 2800 BCE), for 18 years. 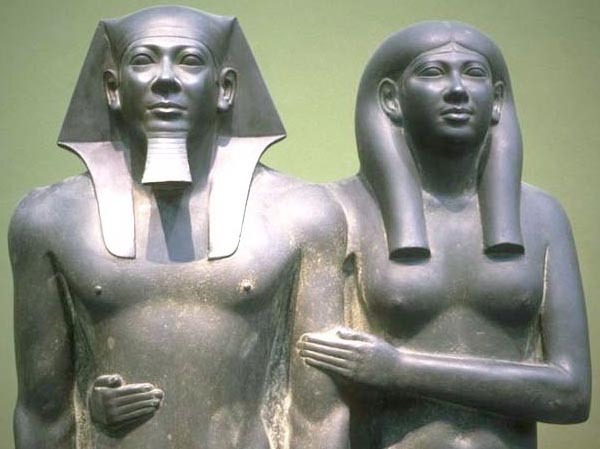 Dates put forward by different scholars for the statue of Menkaure and his queen currently span a period of 130 years, ranging from as early as c. 2600 to as late as c. 2470 BCE (or now c. 2900 to c. 2770 BCE). Menkaure's heiress-queen, according to my own reconstruction of the female royal line, was probably the great granddaughter of Hetepheres I, the heiress-queen of Sneferu, the first pharaoh of Dynasty IV. Sneferu's parentage is unknown, though it is thought he may have been the son of Queen Meresankh I who may have been related through marriage to the family of Huni, the last pharaoh of Dynasty III. There are no records to show Sneferu was related by blood to the family of Huni. He evidently attained the position of pharaoh through his "marriage" to Hetepheres I, and he was sufficiently unconnected with the royal family of Huni to bring about a change in dynasty. Sneferu's consort-queens bore him numerous sons, among them Kanefer, Khufu, Ankh-haf, and possibly Rahotep (who married Nofret), and several daughters. Meanwhile, Queen Hetepheres I married a consort-king and among their children were the daughters Hetepheres II and Meresankh II. When Sneferu died after 24 years on the throne, it was Hetepheres II, as the new heiress-queen, who "married" Sneferu's son Khufu (Cheops), making him the new pharaoh. Khufu's mother was probably Queen Henutsen. It seems clear from the tombs surrounding Khufu's great pyramid at Giza that other women in the royal family were also recognized as queens - his sisters (other daughters of his own mother), half-sisters (daughters of Sneferu's consort-queens) and, it would seem, even his step-mothers (Sneferu's consort-queens, such as Queen Merytyetes [Meritites] - and all were "married" to him. When Khufu died after 23 years on the throne, Hetepheres II seems to have first "married" Kawab [Kewab], Khufu's son by a consort-queen (not Merytyetes, as has been suggested) and Hetepheres II's half-brother-through-heiress-marriage. However, no record survives of Kawab ever being pharaoh. It seems very probable that he died (possibly even murdered, it has been suggested), at which point Hetepheres II then "married" Radedef (also written as Dedefra), another of Khufu's sons by a different consort-queen, who became pharaoh and reigned for 8 years (according to the Turin Papyrus). In the meantime, Hetepheres II (and not another woman identified as "Hetepheres A") had joined in a consummated marriage with Ankh-haf, who was perhaps the son of Sneferu and a consort-queen. I would suggest that their first-born daughter was Meresankh III (she is also thought, however, to be the daughter of Hetepheres II and her first "husband" Kawab). Meresankh III, as the new heiress-queen, "married" her uncle Khafre (Chephren), a "son" of Khufu and the builder of the second pyramid at Giza. As in the case with his father, Khafre also "married" his "sisters", including Queen Khamerernebty I, one of Khufu's daughters by a consort-queen. At this point, the records used to reconstruct the chronology of succession at this time become unclear and contradictory. Khafre may have been succeeded directly by Menkaure, but there is also the possibility that one, two, or even three pharaohs (Bikheris, Thamphthis, and Seberkheres) may have sat on the throne for an unknown period after Khafre's death. Part of the uncertainty may be due to real problems of rivalry among the consort-queens and their respective sons which may have started with Hetepheres II's second "marriage", following the death of Kawab, to Radedef. Radedef was a minor "son" of Khufu, of lesser rank than Khafre, and who, on assuming the throne, as if in rejection of that established by the Khufu at Giza, started a new royal cemetery at Abu Roash. When Radedef died, rather than making one of his sons pharaoh, Hetepheres II's daughter, Meresankh III, "married" her uncle, Khafre, thereby restoring the dynastic line and returning the royal family to Giza. However, the "marriage" did not go uncontested, and Radedef's son, Bikheris, engaged in a struggle for the throne in which he may have been successful, perhaps becoming pharaoh at the death of Khafre. Meresankh III was apparently still alive when Menkaure became pharaoh. Did Menkaure become pharaoh through "marriage" with her? Three of Menkaure's queens are buried in small pyramids next to his at Giza, but their names are unknown. Only the name of one of his queens is known, Khamerernebty II, Menkaure's full sister and daughter of Khamerernebty I. Circumstances would suggest that she was only a consort-queen, and not the queen of the female line. In its unfinished state, the statue of Menkaure and his queen lacks any identifying inscriptions. The woman standing next to Menkaure has been identified as Khamerernebty II, but that is because hers is the only name we know among Menkaure's queens. According to the argument laid out above, it seems more likely that she is, in fact, Meresankh III. An inscription over the door of Meresankh's tomb (discovered in 1927) records that she died in the first year of a unnamed pharaoh and was buried nine months later. It has been argued that the unnamed pharaoh was Menkaure's successor, Shepseskaf. From an examination of Meresankh's skeleton, it has been estimated that she died when she was a little over 50 years old. According to one reconstruction of the chronology of Dynasty IV, Menkaure was pharaoh for 18 years. Although carved late in Menkaure's reign, in preparation for his tomb complex, the statue now in Boston was perhaps conceived as representing a moment at the beginning of his pharaohship, when his claim was being legitimized or confirmed or established by the woman standing next to him. At that point in time, Meresankh III would have been in her early thirties, which looks about right for the woman in the statue.